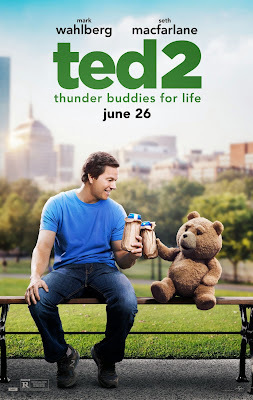 A new red-band trailer has been released for "Ted 2" along with a clip and a new poster. Written, directed and voiced by Seth MacFarlane, the sequel finds the foul-mouthed teddy bear in a dillema. Both he, or it, and his girlfriend Tami-Lynn (Jessica Barth) want to have a baby, but in order to qualify to be a parent, Ted will have to prove he's a person in a court of law. The new trailer is hilarious. I can't remember the last time I laughed out loud while watching a movie trailer, but I hope that they didn't just throw in all the best stuff. The "Law & Order" gag was pretty amazing. The film also stars Mark Wahlberg, Amanda Seyfried, Liam Neeson, Giovanni Ribisi, John Slattery, Patrick Warburton and Morgan Freeman. "Ted 2" opens in theaters on June 26th. Check out the trailer, clip and poster after the jump. "Seth MacFarlane returns as writer, director and voice star of Ted 2, Universal and Media Rights Capital’s follow-up to the highest-grossing original R-rated comedy of all time. Newlywed couple Ted and Tami-Lynn want to have a baby, but in order to qualify to be a parent, Ted will have to prove he's a person in a court of law. Joined once again by star Mark Wahlberg and fellow Ted writers Alec Sulkin & Wellesley Wild, MacFarlane produces the live action/CG-animated comedy alongside Bluegrass Films’ Scott Stuber, as well as John Jacobs and Jason Clark."